XINBEI, TAIWAN (TraNews) – Yang Mama’s Diner has been opened in Luzhou for nearly two decades, offering a wide variety of traditional snacks to tempt customers’ taste buds. A-gei served in a clear broth is one of the top-selling items in the store. Not only do the nearby school students and residents love to dine here, but quite a number of visitors from elsewhere would pay a special visit to Yang Mama’s Diner from time to time. A-gei are deep-fried tofu encased with flavored crystal noodles and sealed with fish paste. This is typically served in a piping hot clear broth. A homemade chili sauce can further be added to enhance the flavor. Customers are welcomed to indicate degree of spiciness desired. 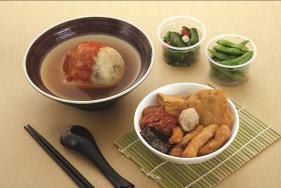 In addition to its ultra-popular A-gei, such as oden and steamed meat buns also taste amazingly delicious. At present, Yang Mama’s Diner also provides take-out and home delivery services.